"Roll-around-on-the-floor-funny." The first teaser trailer has debuted for the latest sequel to The Trip, the road trip comedy starring Steve Coogan and Rob Brydon. This latest film is titled The Trip to Spain and it's literally about, as the title says, their trip to Spain. This is fun teaser trailer because it introduces the sequel ever-so-perfectly, not only with quotes and footage of them driving and singing (like idiots), but with the title cards explaining where each film premiered. I wish there was more footage in this teaser, but maybe it's best that we don't see anything else. Better to just go in and experience this. If you loved The Trip or The Trip to Italy before this, make sure you catch this film when it arrives. Hopefully it's just as funny. Dive in. Steve Coogan and Rob Brydon reunite with director Michael Winterbottom for another chapter in their hilarious road trip series. 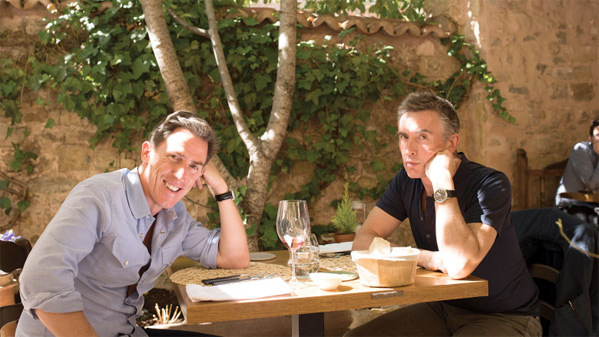 This time taking their wit and appetites on a tour through picturesque Spain’s finest fine dining, Coogan and Brydon trade celebrity impressions and witty banter over paella and gazpacho, their comic observations on fame and friendship as dry as the finest Spanish wine. The Trip to Spain is both written and directed by English filmmaker Michael Winterbottom, of the first two The Trip films, as well as Butterfly Kiss, Jude, Welcome to Sarajevo, Wonderland, 24 Hour Party People, Code 46, The Road to Guantanamo, A Mighty Heart, The Killer Inside Me, and The Look of Love previously. The film premieres at the 2017 Tribeca Film Festival this spring. No release is set yet. Looking forward to this?